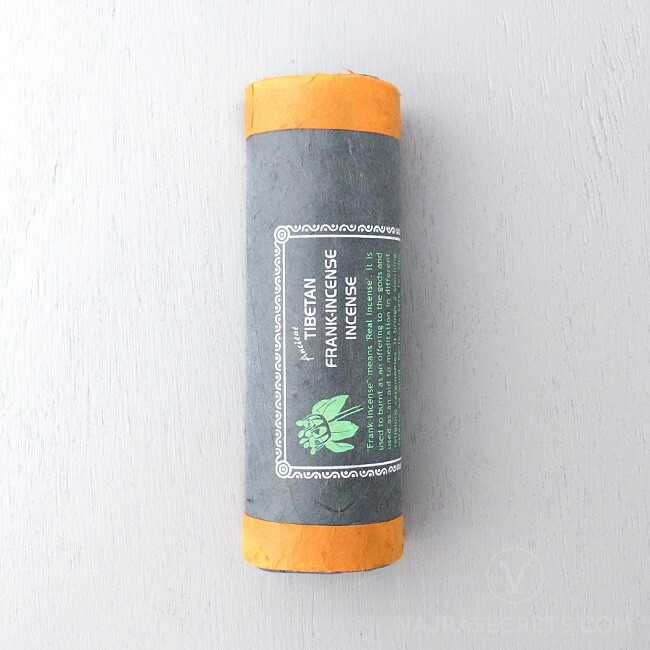 Tibetan Frankincense Incense Sticks are traditionally hand-rolled from natural herbs, resins, oils and other ingredients. This highly aromatic incense releases an uplifting scent when burnt, which promotes awareness, serenity and relaxation, making it highly suitable for meditation, visualisation and yoga. Tibetan Frankincense Incense Sticks are traditionally hand-rolled from natural herbs, resins, oils and other ingredients. Frankincense, also known as Boswellia, is one of the most highly valued substances since ancient times. One of the gifts that the Three Wise Men presented to the baby Jesus, frankincense is commonly used by Christians, Jews, Muslims, Hindus and Buddhists for religious rituals and ceremonies. This highly aromatic incense releases an uplifting scent when burnt, which promotes awareness, serenity and relaxation, making it highly suitable for meditation and yoga. It is excellent for cleansing and purifying the environment of unwanted energies and to aid stress-relief. It is also particularly used during spiritual ceremonies to create a peaceful and calm atmosphere.